You'll start off in the style and sophistication of Buenos Aires before flying north into the sub-tropical rainforest around the Iguazu Falls. 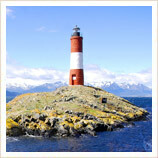 From here, you'll fly right to the south of Argentina and the beautiful mountains of Patagonia. 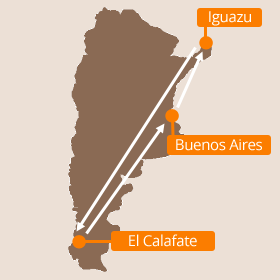 Your holidays in Argentina begin today with arrival in Buenos Aires, the capital of Argentina and one of the world’s great cities. 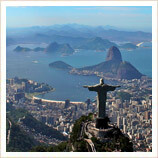 On arrival we’ll meet you and take you to your hotel in the centre of town. You’ll be having a full city tour tomorrow, but you’re just a few blocks from all the main sites, as well as from restaurants and cafes, so you’re perfectly placed to head out and start soaking up the unique atmosphere of Buenos Aires. Today you will see the highlights of Buenos Aires, but there are plenty of alternative city tours which can be tailored to your specific interests, including: art; graffiti; gastronomy; architecture; football; tango; Evita; Pope John Francis; bike tours; or even a helicopter ride! Just ask us for more information. If you’d prefer another tour today then just let us know. 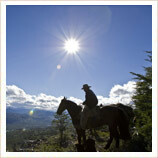 You could spend the day at a nearby ranch for some horse riding and a traditional ‘asado’ barbeque. 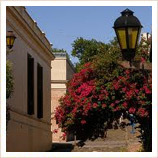 Alternatively, Uruguay is just a short ferry ride away so you could spend the day visiting either the capital of Montevideo or the picturesque Colonial town of Colonia. 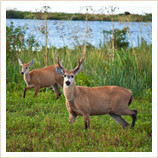 Wildlife lovers should consider a jeep safari down the Macuco Trail after your tour today. It’s the perfect way to get up close to some fantastic Brazilian mammals and birds, and it ends with a boat trip down the Iguazu River. If you'd like a more adventurous time of things today, why not take to the river for some whitewater rafting? How about some ice trekking on the glacier today? 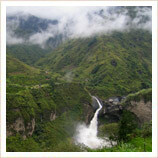 It’s a fun experience and gives you more time to admire the beauty of the National Park. Just as us for more information! 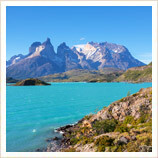 If you'd like something more organised, how about a trip over the border to Chile and the amazing Torres del Paine National Park? In the humid sub-tropical north of Argentina, the vast Esteros del Ibera wetlands are a haven for birds and wildlife, with almost no roads or people to interfere with the pristine nature on offer. A visit to the area allows you to really get away from it all, staying on a converted ranch, reached by either jeep or horseback, and heading out each day to see some of South America’s most beautiful scenery and rarest wildlife. Our standard price for these holidays in Argentina is £1995 per person, which is based on two sharing a double or twin room in our standard hotels. That price includes all your accommodation, internal transport, transfers, tours, guides and entrance fees, plus lunch on your Gable Island and Perito Moreno tours, and breakfast every day.